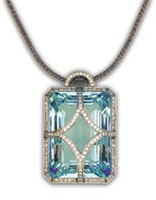 March’s birthstone is a cool plunge into a refreshing pool! Aquamarine is the birthstone for March and the gem of the 19th wedding anniversary. The name aquamarine is derived from the Latin word aqua, meaning water, and marina, meaning the sea. This gemstone was believed to protect sailors, as well as to guarantee a safe voyage. The serene color of aquamarine is said to cool the temper, allowing the wearer to remain calm and levelheaded. Its pale, cool color beautifully complements spring and summer wardrobes. Aquamarine is most often light in tone and ranges from greenish blue to blue-green; the color usually is more intense in larger stones. This gemstone is mined mainly in Brazil, but also is found in Nigeria, Madagascar, Zambia, Pakistan, and Mozambique. The Hirsch Aquamarine is an enormous 109.92 carat fancy emerald-cut gem. It is 100% natural, free of any heating or other color enhancing treatments as is so common in aquamarines. The color is a perfect aquatic blue as rich as the stone’s wealthy namesake. The luster of this gem is absolutely amazing. 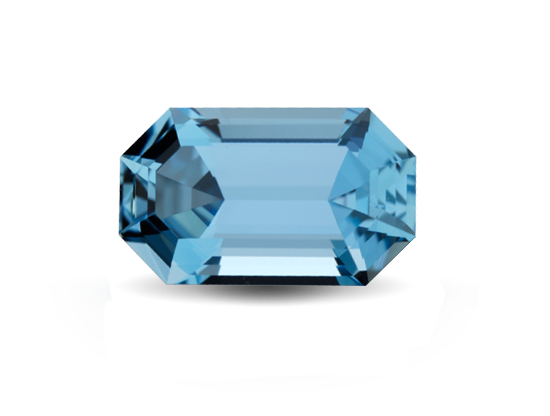 In recent history, a rumor began circulating that the table facet of the Hirsch Aquamarine had been scratched. However, that was nothing more than urban legend as anyone who has personally inspected the stone can verify for themselves. the House of Louis XV has created an exquisite pendant by intricately appointing the stone with 118 diamonds set in 18K white gold. The Dom Pedro Aquamarine was mined from a Brazilian pegmatite in the late 1980s, and was named for Brazil’s first two emperors, Dom Pedro Primeiro and his son, Dom Pedro Segundo. Before cutting, the portion of the beryl crystal from which the obelisk-shaped gem was fashioned measured 23.25 inches long and weighed nearly 60 pounds. 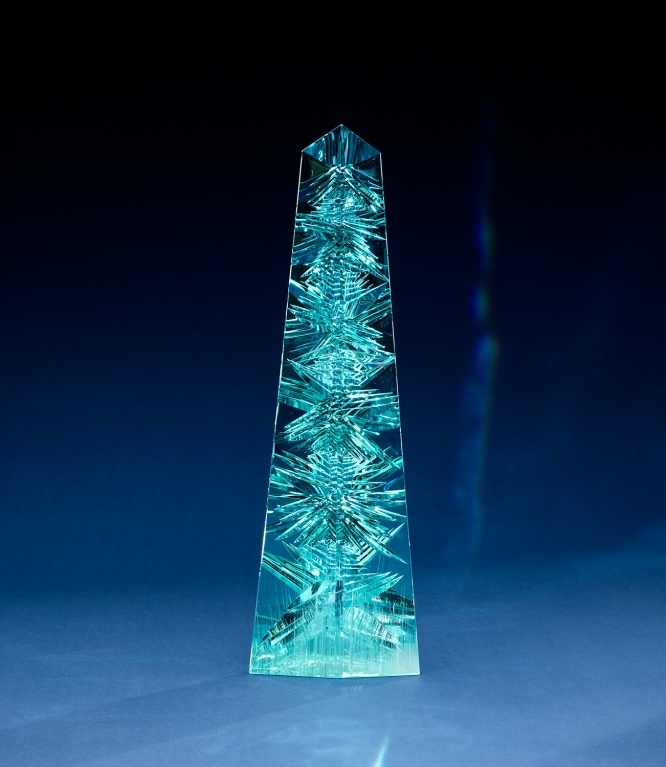 The obelisk, designed by world-renowned gem artist Bernd Munsteiner, stands 14 inches tall, measures 4 inches across the base and weighs in at 10,363 carats or 4.6 pounds. These impressive dimensions render the Dom Pedro the largest cut-and-polished gem aquamarine known. A pattern of tapering “negative cuts” faceted into the reverse faces of the sea-blue obelisk serves to reflect the light within the gem, giving the piece surprising brightness and sparkle. With the proper lighting, this remarkable sculpture appears to be illuminated from within. Sources: American Gem Society and Gemological Institute of America, World Famous Gems and the Smithsonian. Great Ways To Pop The Question This Christmas! Welcome to The King’s Jewelers’ Blog!